I had thought I would be posting more when Trevor started this blog, then baby, then life, and so here we are with the first guest post!!!! If you follow my Instagram at all, you might have guessed that I like carrying my baby, like A LOT! We went through a large number of wraps and have kept almost all of them as they each excel in different situations. Here are the ones we have and use in no particular order. The Boba was the first wrap I got. Boba's are one of the major brands, highly recommended, and upon trying it on, extremely comfortable. One problem, we live in the oven that is South Central Texas and the Boba is some pretty thick material. In the heat of the summer, wearing that thick of material, over your normal clothes, with a tiny human heater makes for not a lot of fun 😝. However, in cases where you need a little extra warmth (winter, airplane, movie theater) this wrap does the trick. Learning to wrap it takes a minute but once you have the pattern down, you can use the same wrapping technique for any wrap, even the hubby was able to figure it out. In an effort to find a wrap the was more appropriate for the local climate, we stumbled upon the K'Tan Breeze at our local baby store (#shoplocal). This thing is a bit different in that instead of being a true wrap, it is two circles of fabric that are inter-twined. The material is very light and was our preferred wrap for going to the pool/lake/river. The material dries quickly so it is perfect for a day out in the water with the baby. This carrier is more fitted (not adjustable) unlike the wrap, so I was able to carry the little baby in it longer than Trevor could. Because the material is thinner, the comfort does go down a bit, so this is definitely not the wrap to wear all day long. But if you are doing something active or in warm weather, this is the way to go. Just like the K'Tan, I was looking for another lightweight wrap that was more adjustable and found the Beachfront Baby Everyday Wrap online, as a plus the wrap is produced locally here in Texas (#shoplocal). This thing is the same as the Boba but a much lighter and more breathable material. So much so that this is our preferred wrap for going to the pool/lake/river. The material dries quickly so it is perfect for a day out in the water with the baby. Similar to the K'Tan, the thinner material does decrease comfort a bit, but is worth the light weight and quick drying. If the Boba is too hot and the K'Tan is too cool, then Moby is "just right"! Moby is a good balance of weight of material, comfort, and temperature. There is not much else to say, but if the Mr. can wear this one by choice, it deserves a vote for sure. This wrap works exactly the same as the Boba and the Beachfront wrap in that it is one long piece of material and is adjustable to almost any size person. Ok, I didn't buy this one, Dad got this as a gift from his brother, but he does swear by this thing. 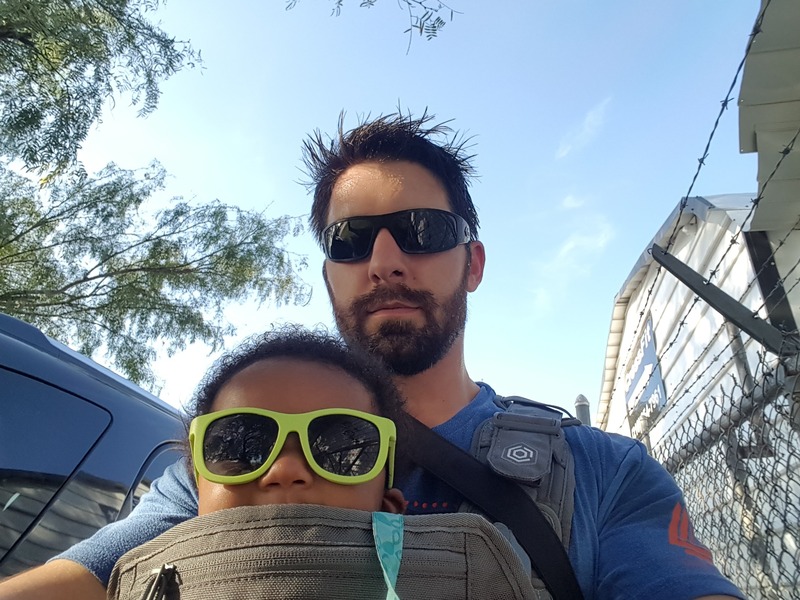 The Mission Critical Carrier is the MAN'S MAN baby carrier. Basically a piece of military gear, the carrier looks like a bullet proof vest. Your baby will have to be a bit older for this carrier as it cannot be adjusted nearly as well as a wrap. This carrier is best used in transit as it does not provide much comfort if you are sitting down. It is also on the warm side, so be ready to have a soaked shirt underneath. The kid loves it though and you get a ton of smiles and looks from folks (so Trevor says- I haven't worn it).